So that 7 a day series I mentioned. A new vegetable each week and all that. Not really happened, has it? I am blaming the artichokes. It is definitely the artichokes’ fault. When I stupidly asked for reader suggestions for which vegetables to cover I got celeriac (which filled me with terror but which I figured I could legitimately dodge for the time being on ‘seasonality’ grounds) and artichokes, which are very firmly in season and thus less easy to sidestep. The problem? As much I liked both looking at them and eating them, I had never actually cooked them at home and had always been put off doing so because the preparation looked a bit difficult and time consuming (mostly just difficult). Unfortunately, the reader who suggested them is an old friend in front of whom I will never (EVER) concede defeat and thus I was forced to spend hours, days, WEEKS, battling artichokes in my kitchen until I mastered their dark secrets. I have even taken step by step photographs for you! 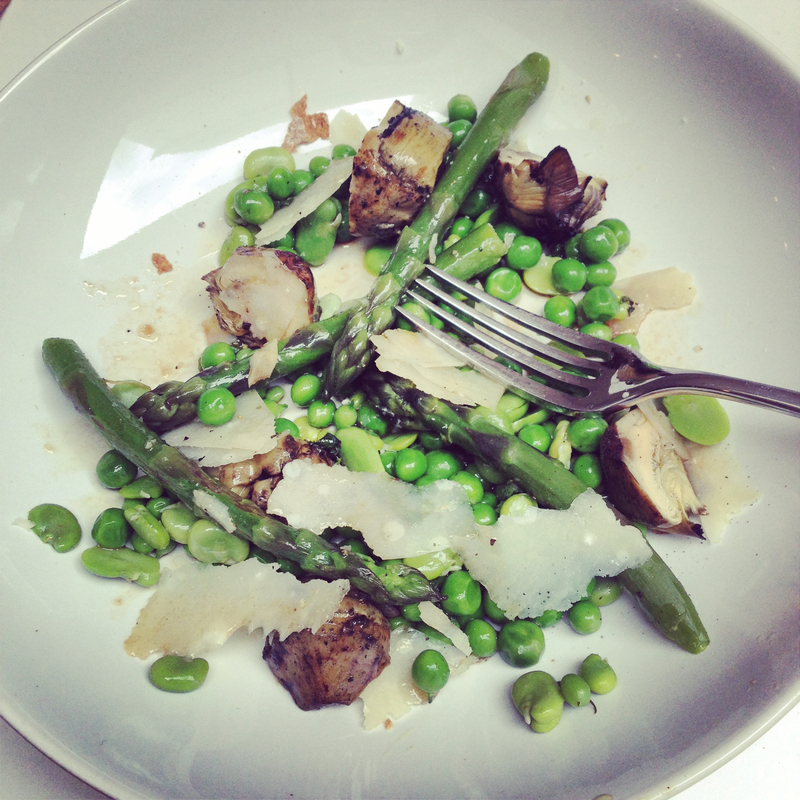 So here we are, one month to the day after the asparagus post, with the second installment of 7 a Day! What? We are talking about the globe artichoke here (the edible unopened flower of the thistle), not Jerusalem artichokes (which are the tuber of a sunflower). They are really very different things. The globe artichoke is the one that looks like a hand grenade and is one of those things (like lobster) that I often wonder what compelled anybody to first try eating one. There are a number of varieties and you will see a range of different types and sizes for sale: the larger Green Globe through to the small and very beautiful French and Italian purple varieties like Violetta, Anzio and Violet de Provence. 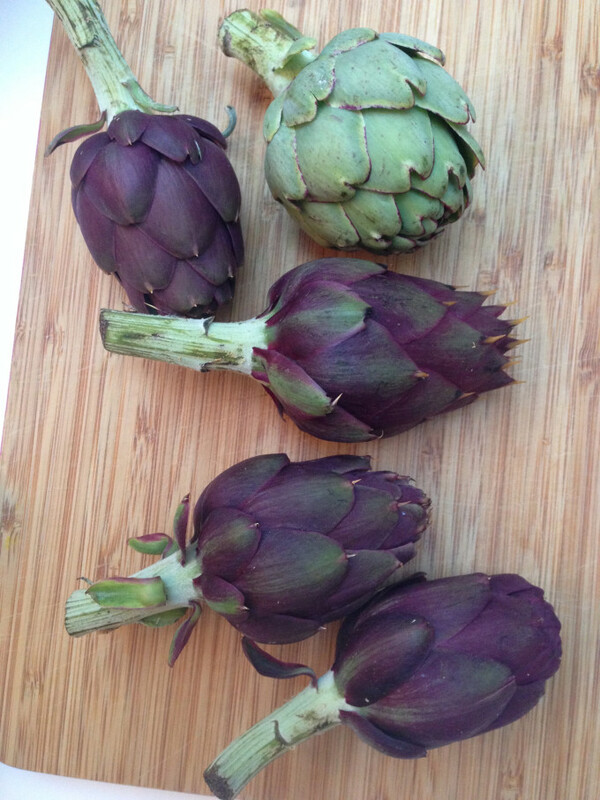 Artichokes grow well in warmer climates, which is why most that you see for sale in the UK come from France or Italy. 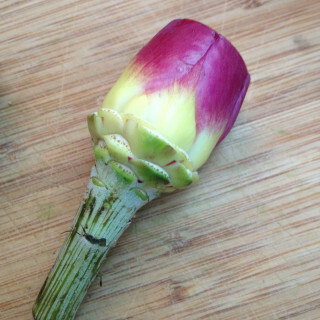 They are not grown that widely in the UK but you do see them more and more on farmers market stalls now. The larger ones lend themselves better, in my humble opinion, to being cooked whole and eaten leaf by leaf (and you are rewarded by the fact that they have bigger hearts) and I tend to look for the smaller varieties to use for braising, grilling or roasting as they are usually more tender and are easier to prepare as the hairy choke in the centre is less developed. 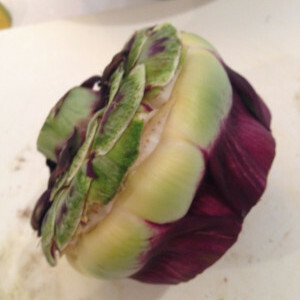 Buying/Season: Always looks for tightly closed leaves and artichokes that feel heavy for their size (it means there is more moisture and they are fresher). They should squeak a bit when you squeeze them. They do appear in bigger supermarkets from time to time but I have found farmers markets and greengrocers to be a more reliable source. Natoora sell very lovely small purplely green varieties directly or via their Ocado store. (Fresh artichoke hearts/bottoms are also available in frozen packs – Middle Eastern supermarkets are a good hunting ground – and these are great for braises/tagines but I have not been able to find them other than in enormous 2kg packs, which is quite a lot of artichoke for anyone). Storage: They are best eaten as soon as possible after buying but they are a little forgiving if you sprinkle them with water and pop into the fridge in a plastic bag for a few days. The Health Bit: Traditionally eaten by the Romans and Greeks to maintain a healthy digestive system. Chock full of antioxidants. Thought to reduce cholesterol and support kidney and liver function. High in fibre and beneficial inulin (a soluble fibre that increases absorption of calcium, magnesium and iron). Vitamins C, K and B6 and lots of minerals too. According to the NHS, roughly 2 hearts makes up one “serving” for your 5/7 or 10 a day quota. 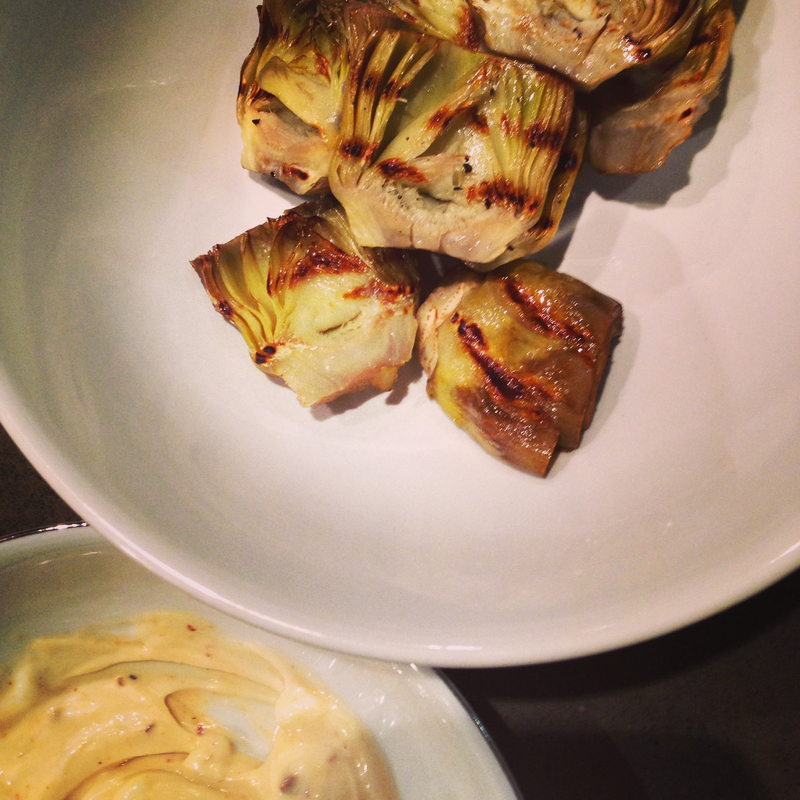 Preparation: This is the key thing you have to master with an artichoke as they are a doddle to cook. How much preparation you do depends on how you want to cook them and how big they are. It is not a quick task on any view so stick the radio on and pour yourself a beverage before commencing. I am going to explain how to prepare them for roasting, grilling, sautéing or braising as that is how we most commonly eat them (now that they are my new best friends) and it is the most useful way to prepare them as you can use them for a whole host of recipes once you know how to do it. If they are very small and tender, you can also eat them raw, either on their own or added to salads. You basically follow the steps below but have to go a few layers further in until you get to the very very tender leaves. At the end of the scale is the more traditional preparation whereby they are steamed whole and then eaten leaf by leaf with a dipping sauce until you get to the heart, which you then eat. If that is what you are after, it is pretty straightforward – have a look at this guide and recipe here. We don’t often do this as it is more a starter than a main course and I am sort of with Miss Piggy on this one and tend to lose the will to live half way through eating them. (Which is pretty much how you are going to feel about this post very soon). My absolutely all time favourite way to eat them is deep fried whole – carciofi alla guidia – a traditional dish from Roman-Jewish cuisine. If you are ever in Rome go to Piperno and eat them. I really couldn’t find an angle to shoehorn deep fried vegetables into a healthy eating blog (I really did try) but I am just going to leave this recipe here, in case you fancy it. 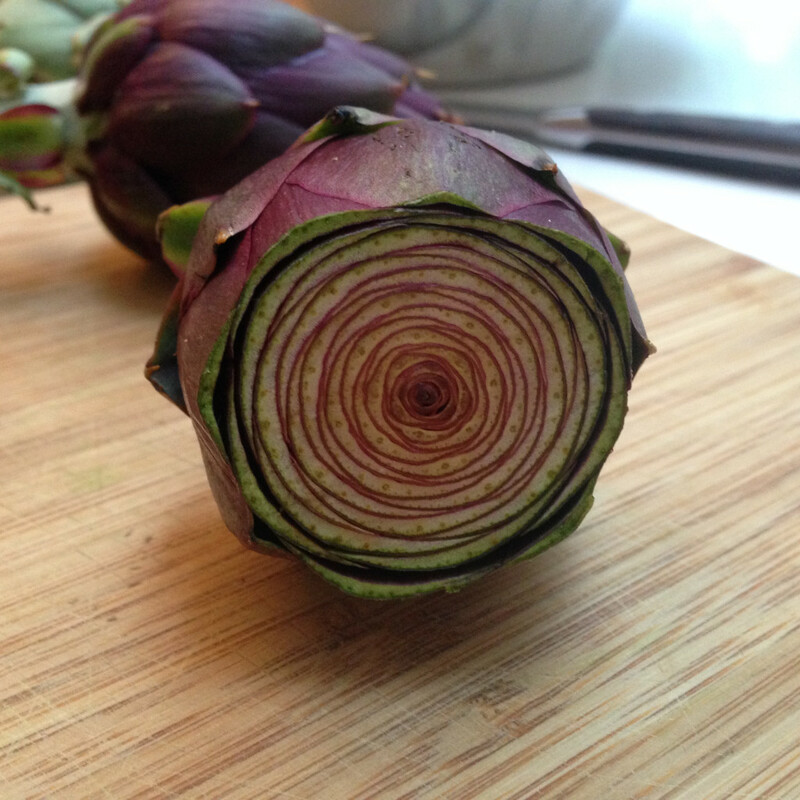 The first couple of times you do this you will be amazed at much of the artichoke you are ‘wasting’. Be ruthless though – you will waste even more of it if you leave the tougher leaves on, cook it and make the whole thing inedible. You will need a couple of goes at this to become more confident as to how much to leave on but you will get the hang of it pretty quickly and be able to tell how fresh/tender your particular specimens are after a few attempts. 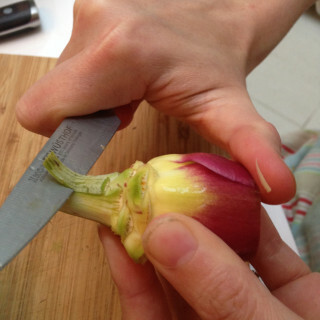 You will need: a small (paring) knife, a bread or similar serrated knife, kitchen scissors, a teaspoon, a bowl of cold water with the juice of a lemon added and half a whole lemon (this is to stop the cut surfaces of the artichoke oxidising and going brown). 1. With a serrated knife, chop of the top 1/3 of the artichoke – this should be just above its widest part, where the leaves start to taper in again. Rub the cut surface all over with the lemon. 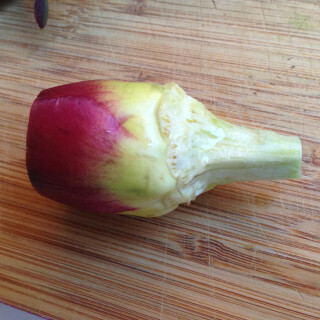 If your artichoke still has a lot of the stem attached, chop it off leaving 2-3 cm of stem attached (as in the first picture above). 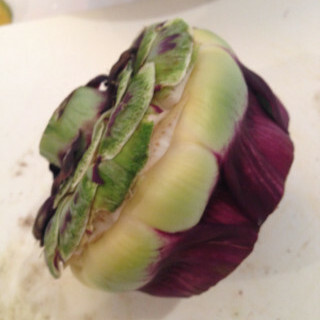 Cut the artichoke in half. Depending on how big/old it is it may or not have a fuzzy choke in the centre. You ABSOLUTELY need to remove it as your throat will reject it violently if offered it. Small artichokes often very little or no chokes (bonus!) while bigger ones will have a lot – see pictures below. You remove it with a teaspoon (or with smaller ones I find the paring knife works too) trying not to scrape away the lovely soft heart below it. Pop them into the bowl of acidulated water, and start on the next one. Some recipes suggest cutting them into quarters at this stage – I tend to wait until cooking (and cut then into quarters or slices depending on the recipe) so that less of the flesh is exposed to the air until the last minute. Artichoke Cooking & Eating Tips: Once you have got the artichokes down to tender leaves and heart as above, you can pretty much cook them however you like. Cut into wedges and sauté them in olive oil until golden. Rub them in oil (dry them well first) and pop into the oven with some bay, garlic cloves and a little water and roast for around 30 minutes at 180ºC. They are also really good cooked on a barbecue or griddle (you can steam them briefly first to part cook them when doing this but I usually just stick them straight onto the griddle if they are small). Artichokes pair well with butter, olive oil, garlic, walnuts, hazelnuts, citrus fruits, goats cheeses, olives, most of the soft herbs (especially tarragon, parsley and chervil) as well as their fellow spring/summer vegetables like new potatoes, peas, asparagus, fennel and chicory. 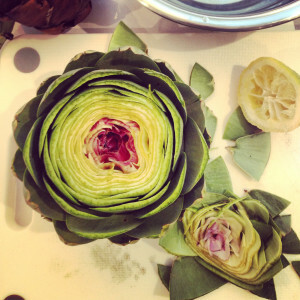 If you are looking for artichoke inspiration, your Italian cookbooks are your friends. As the world’s biggest grower, the Italians have the artichoke all figured out and have endless delicious ways of cooking them. Similarly, middle eastern cuisine features artichokes prevalently, often in stews and tagines. One brilliant way to cook them is in an Italian style spring vegetable stew – something close to what the Sicilians call a Frittedda and the Romans call Vignarola. In the interests of the length of this post and my own sanity I have stuck that recipe into a separate post. - 8 artichokes (prepped as above and cut into thick slices). Sauté the artichokes slices in some olive oil over a low/medium heat for 10-15 minutes, turning occasionally until they are just tender. Scatter over the parmesan and parsley and bake for 10 minutes. Eat, but not with nice wine. As artichokes do something to render nearly all wine disgusting.